An important cautionary tale for young teens about staying safe online, with some inconsistent views on body-image. 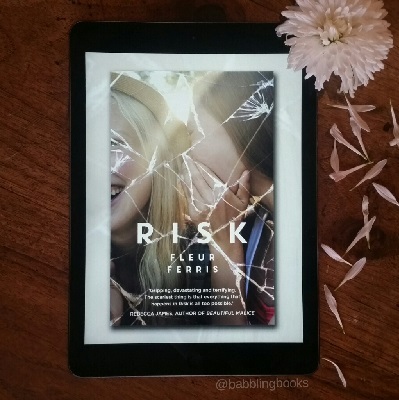 Though it errs on the ‘preaching’ side of the divide, Risk is still an engaging novel by an author who clearly understands both the risks and realities on the online activities of young adults. The main drawback is in the way some other teenage behaviours are presented. There are some pretty heavy issues addressed in this novel, such as: death of a parent, death of friends/classmates, bullying, and cyberstalking. They are for the most part dealt with well, the seriousness or challenges of dealing with emotional responses is not underplayed, though some scenes or recreations by characters do seem designed to prove a point rather than develop the characters in a meaningful way. I had a couple of issues with how the book dealt with the theme of body image, or rather, didn’t deal with it. This is in no way impacts the plot, so the following is not a spolier. The main character observes a few times early in the novel that she believes she is a bit overweight and unattractive, there is no evidence that this is the perception of others. When she begins running, for appearance rather than health, this is presented as a positive. Later in the book as she is under a lot of stress she observes that she has lost quite a lot of weight and feels pretty, like other girls. This section though incredibly brief really bothered me. Losing weight due to stress is in no way healthy, nor should it be celebrated. I don’t think it is possible to write a novel that is ‘morally’ strong about one aspect of a teen’s life and so ambivalent about another. Especially when body-image and self respect are huge facters in teens risk-taking behaviours and tendencies, including the risks they take online. So despite the strong positive message about safety online and overall quality of the writing throughout, I’m on the fence as to whether I would recommend this to a teen I know.